“The hardest paddle I’ve ever done” — 8 days, 1 hour and 42 minutes in the Yukon wilderness. As paddlers were standing on the shores of Molokai last Sunday morning, staring out at Oahu in the distance and preparing for one of the most challenging races of the year, Bart de Zwart and Ike Frans were taking their final strokes along a very different, much less fabled but far more difficult course. 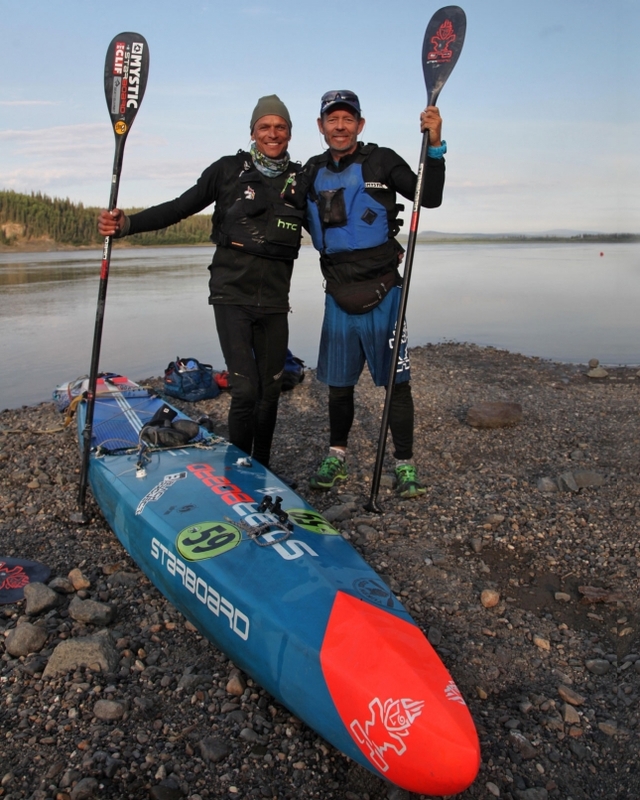 On Sunday morning Alaska time, just 45 minutes before the start of Molokai2Oahu, Bart and Ike crossed the line to win the Yukon 1000, a mind-boggling race through some of the most remote territory on the planet. They’d been paddling since early Saturday …of the previous week. After 8 days, 1 hour and 42 minutes, Bart and Ike won the world’s longest canoe race, an epic, 1609 kilometre-long adventure that stretches from Canada’s Yukon territory across the U.S. border into Alaska. The “race” (perhaps *odyssey* is a more fitting description) is an extraordinary test of both physical and mental strength, as competitors paddle 18 hours per day with almost zero human interaction except for their single team mate. Re-supplying is not allowed, meaning all food, camping gear and safety equipment – the mandatory check list is 33x items long – must be carried on board from start to finish. In a canoe that would add some weight, but on a stand up paddle board it becomes a genuine burden. Throw in near-endless daylight, paper-and-pencil navigation through a confusing series of twists, turns and islands in the latter stretches of the river, and the stress of having to find a bear-free camping spot on the river banks by 11pm each night, and you can perhaps start to appreciate just how special this event really is. 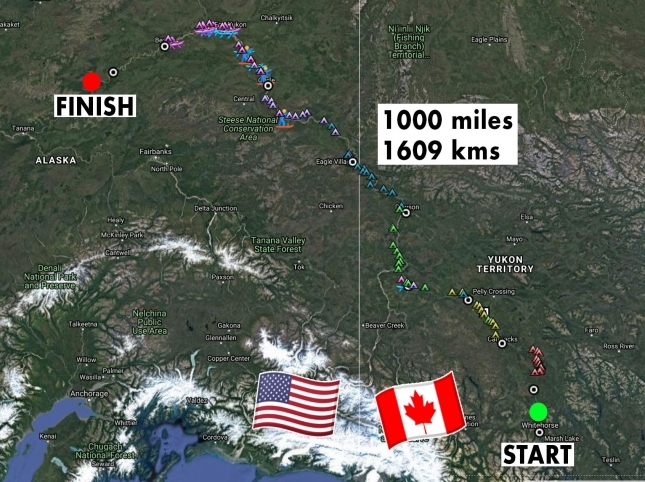 The rules of this race are fairly simple: Start in the town of Whitehorse and paddle 1000 miles to the Dalton Highway Bridge as fast as you can with at least six hours rest each day. All teams must compete in pairs, which is relatively straightforward in a two-person canoe but means the stand up paddlers have to paddle side-by-side for a week straight. To ensure nobody pushes themselves *too far*, competitors must be off the water between 11pm and 5am to get their mandatory rest. 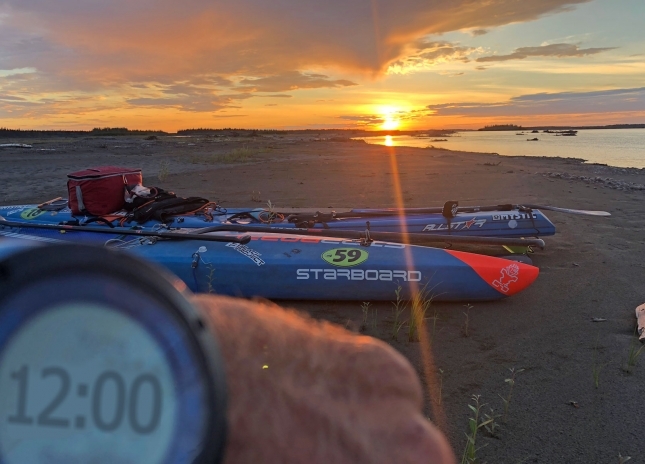 That makes for a maximum of 18 hours paddling time per day, and while this is more than just a race, the Yukon 1000 is still a race, which meant that most teams would take the minimum 6 hours rest and spend the rest of the day paddling themselves to the brink of collapse. Bart told me they tried to max out their 18 hours every day and never wasted more than 45 minutes, or in other words: 17-18 hours of paddling per day, every day, for over a week. If they were lucky, they’d get 4 hours sleep in a night. 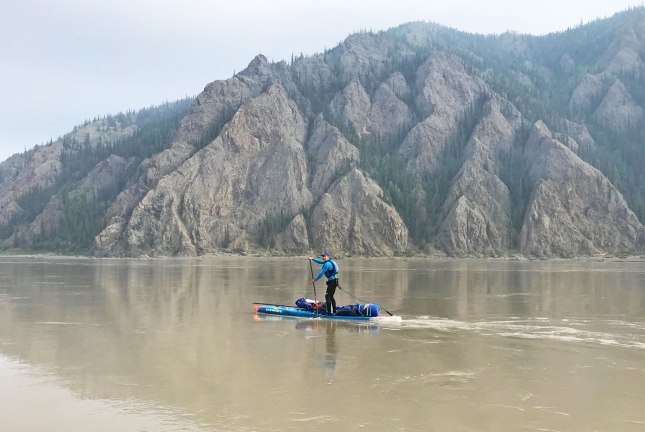 Bart and Ike weren’t the only stand up paddlers on the river this year, and it’s also not the first time SUPs have officially competed in the Yukon 1000: Chattajack founders and ultra-endurance adventure couple Ben and Kim Friberg pioneered the course back in 2014 to see if it was even possible (it was), which convinced organisers to allow stand up paddlers to enter future editions. This year is the first time since 2014 that anyone has attempted the course on a SUP, with three teams accepting the challenge: Team Starboard (Bart and Ike), CocoPlum Navy (Scott Baste and Chip Walter from Florida) and the appropriately-named “Extremely Insane SUPMADKIWI” (Tony Bain and Alex de Saint). To the amazement of the canoe teams, all of the stand up paddlers finished. In fact, only one of the 15 teams abandoned the race, though it’s worth noting that 17 teams were denied entry–organisers have a rigorous vetting process to ensure only experienced paddlers are on the start line. If something goes wrong out there, you’re pretty much a goner. To put into perspective just how remote this race is: There were more competeitors in the M2O race on Sunday than there are people *living* along the final 500 mile stretch of this river. Bart told me they would often paddle an entire day without seeing any sign of life–not even a remote cabin let alone another human being. Apparently, more people climb Mt. Everest each year than paddle down the most remote stretches of this river. “Amazing,” is the first word Bart uses to describe the Yukon 1000, “but also the hardest paddle I’ve ever done” he continues. “When we made camp at 11pm on the first night, we realised this was going to be a grueling race. 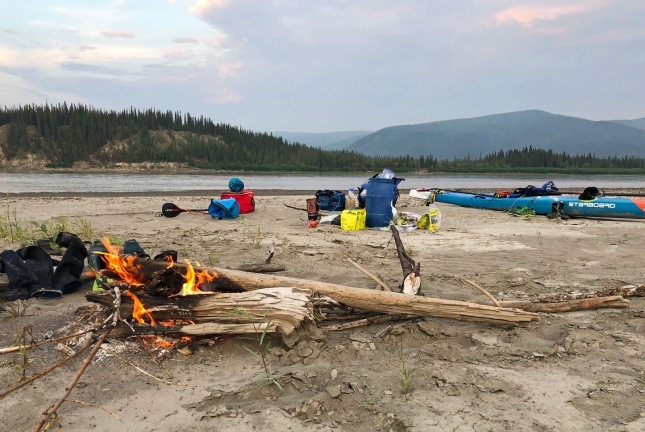 We found a place to camp quickly – this whole river is basically one big, wild camp ground – and, after checking for bear prints, we started to pitch the tents, make a fire and cook our freeze-dry meals. We had to be efficient as possible because we only had six hours to do everything (including sleep) before waking up and continuing to race. “The 30 minutes we had to wind down before bed each night were probably the best of the entire journey. It was a time to reflect and relax after such a long day of paddling. Of course you are feeling sore and tired, but to sit around a campfire in one of the most remote places on earth made it very special. Part of me actually wishes this wasn’t a race so we could have enjoyed those moments a little longer. “We awoke surprisingly fresh each day. The weather was surprisingly good. Almost too good: by 11am each day we were splashing ourselves with water to cool down. It barely rained the entire week, and it also never really got dark given we were up around the Arctic Circle. “The first 700kms of the 1600km race were relatively easy because it follows the same course as the Yukon River Quest, the next-longest race in the world. I’ve done that three years in arow, most recently just three weeks ago, so there were no navigation issues on the first few days. But once we reached the town of Dawson – the traditional end to the Yukon River Quest and the only manned check point in the Yukon 1000 – we were entering new territory, which was both exciting and intimidating at the same time. 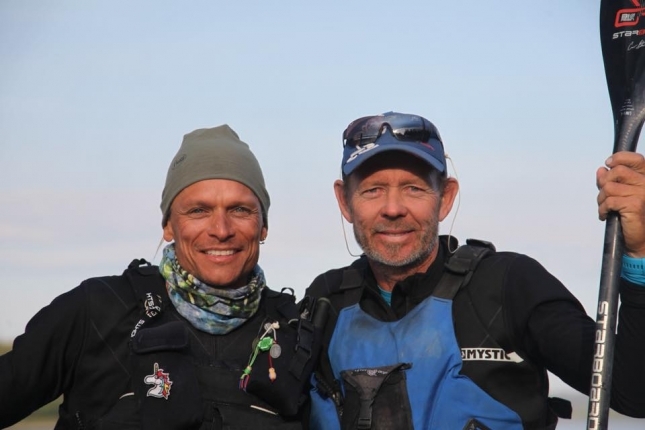 “The concept of racing and staying together in pairs was new to me but in the end worked very well because I was paddling with Ike Frans, a fellow-Dutchman and non-stop 11 City Tour veteran who has an extremely strong mind and fantastic attitude. For safety reasons it’s mandatory to paddle in pairs in the Yukon 1000, simply because it’s so remote. John, the race director, made clear to us before started that bears, wildfire, hypothermia and heat exhaustion were all genuine risks. Throw in the fact we are days away from help if something goes wrong and you really tend to be careful. I clearly remember taking extra caution every time I got out a knife to make food, or even just simple things such as stretching at the end of the day–cut yourself or pull a muscle here and it’s a very long, lonely paddle for help. “There are of course safety precautions in place in case of extreme emergencies, but after you reach a certain point you basically have no choice but to finish. “We were each carrying just under 40kgs (88 pounds) of food and gear. We opted for the 14×26” Starboard All-Star, which is a great compromise between being able to hold our supplies and still being a very fast race board. We carried a long list of compulsory safety gear that included bear spray, enough food for 11 days and other survival items in case we were stranded. It was all necessary equipment but also very heavy–it turned our 10-12kg pro race boards into near-50kg beasts (about 110 pounds). “We reached Dawson, the end of the Yukon River Quest and a symbolic check point in the Yukon 1000, after 3 days. After that, we were on our own. Dawson is basically one of two points along the course with genuine road access, after that we saw some small river villages and remote fishing cabins, but virtually no other signs of human life except at the Canada/U.S. border crossing, which consisted of a 20-house village that suddenly seemed like a major city for us. “By the second half of the race we had a strong lead on the other SUP teams and it became a race against our own minds. We were confident of finishing but the lack of sleep always slowed us down at certain times of the day. We called it the “Sleepy Phase,” and to snap out of it we’d try eating, talking or splashing ourselves with water. When it was really bad, we’d try taking a 15-second power nap, a sort of yoga-like pose where you lay yourself face first over a bag and try to relax for a few minutes. Most of the time you will drift away for a few seconds before the instability of the board rocks you back to life. But for some strange reason, even just 15 seconds of sleep was a big help and allowed us to continue paddling until the late evening. “18 hours of paddling per day is a long time, so you try to break it down into smaller stages. I was in charge of navigating with paper maps, and each page of the map equaled about 60-90 minutes of paddling. So we basically just took it one page at a time. “We would eat almost every hour and drink water almost all the time. You really have to try hard to consume as many calories as possible. In the middle of each day we’d take a 10 minute break and have a proper meal. This was a reward each day. It’s hard to know what you food you will need/enjoy during a race like this, but from my other endurance races and crossings I realised variety is the key. Only eating cereal bars would be horrible. The longer the race, the more salty and fatty foods I like to bring, so my day bag contained a mix of nuts, cereal bars and “ontbijt koek” (Dutch cake). Though definitely our favourite treat was crackers topped with peanut butter and beef jerky. “18 hours of paddling could get boring very easily, but in this race it was never dull. Apart from the extraordinary wilderness and wildlife to appreciate and admire, we had to focus on navigating the river islands and looking for the fastest down-stream currents. The scenery is quite amazing and also very humbling. You feel tiny in this giant green space. It’s around the size of Europe but only has a handful of people living in it. By the fifth day we’d seen eagles, moose, bears and the trails of many wildfires, which at some points were burning right down to the river bank. “On the sixth day we crossed the border at the small village of Eagle. To enter Alaska by water you have to call from a special phone booth that has a direct line to U.S. immigration. After giving all your details we were allowed to enter, so we jumped back on our boards and continued the journey. “At around this point of the race we went back-and-forth with a pair of English guys in one of the canoe teams. They’d paddled across the Atlantic ocean in a record time of 50 days, however they later told us the Yukon 1000 was more draining both physically and mentally. “That evening we found an amazing camp spot with a beautiful midnight sunset that lingered in the sky for hours. Thanks to the extreme northern latitudes, it was almost never dark during the entire race. “The hardest part of each day was 7pm til 11pm, when the body is aching and your mind is craving sleep. You’re tired from a full day’s paddling and ready for a good meal. Sleeping was always easy–as soon as we put our heads down we passed out until the beautiful sound of our alarms awoke us at 4am each day. We always aimed to be back on the water by 5am but sometimes missed it by 15 or 20 minutes. “We had many days of calm breeze and beautiful weather, but also days with a lot of wind: On the Friday, day number seven, we entered a flatter region of terrain and crossed the Arctic Circle, where we were greeted by a nightmare headwind that made life extremely difficult. “Here the scenery changes–no more mountains and many little islands with different routes to go around. Some have strong current and some have very little. Navigation is critical because one small mistake can cost you 30 minutes; a big mistake can cost you hours. “The wind started very early on day seven , straight from the front and very fierce. Sometimes we had a hard time moving at all compared to the water, but luckily the river current was always giving us a little assistance and kept us pushing forward, even if it was painfully slow compared to the other days. “By Friday evening we were extremely tired. Every muscle ached. We found a good sandy spot to camp and beached our bags. To be safe, we checked for bear prints before setting up camp. To our surprise we found a very fresh set of large prints with small footprints right next to it. This wasn’t good. Bears are very protective of their cubs. The prints looked so crisp like the bears had just been there, so after a very short discussion we quickly decided to find a different spot to sleep. “The next day, Saturday, we wanted to reach the finish by 11pm. But as soon as we started we realised how hard day seven had been. Our legs, knees and backs were aching and it was still a very long way to go. “The highlight of that penultimate day was seeing a bear along the river bank. It saw us, stood on its back leg to check us out, looking around and smelling, before making a run for it and climbing up the bank. In this moment, both Ike and I stood still and looked on in awe. We didn’t reach for a camera, just paused to enjoy the raw beauty of this incredible place. “We almost reached the finish by the end of day eight but were a few hours shy. Since we were so close, we decided to stop at 10pm instead of 11 and enjoy an extra hour of rest for our final night on the river. Again we saw bear prints, but not as fresh as the previous day so we decided to stay and camp. “The next day, Sunday July 29th and the same morning as Molokai was happening, we paddled the final four and a half hours to the finish line. 8 days, 1 hour and 42 minutes. We were the first SUP team, and we immediately received our special coins from the race director. “There are no real awards in this race: instead, everyone that finishes receives a special coin in a nice little ceremony as soon as they cross the finish line. It’s very military-like, with our race director explaining that in ancient Roman times warriors would trade coins at the end of a fierce battle. It was a unique way to finish a unique race. “The finish line is under the Dalton Highway Bridge. It’s one of only two bridges we passed during the 1000-mile, 1600-kilometre voyage. This is the only road that goes north all the way to Deadhorse (the name speaks for itself) and is a tiny outpost with one restaurant, a few houses and a place to sleep. Before this bridge was built, the trucks heading north could only do so in the winter time when the Yukon River would freeze over. It’s a wild and remote part of the world that puts many other things in life into perspective. “Relieved to have finished, we spent the next day recovering and talking story with some of the canoe teams. We also wanted to be there when the next two SUP teams arrived: Scott Baste & Chip Walter and Alex de Saint & Tony Bain. After completing this race you know just how much mental strength this expedition requires. On a stand up paddle board it’s particularly tough, so we wanted to show our support for the other guys that had done such an incredible job to finish. They all made it: Scott and Chip after 8 days 20 hours, and Tony & Alex after 9 days and 12 hours. “Apart from some damaged nervies in my fingers and toes, my body is recovering well. It’s really astonishing what the body can do and then how quickly it can recover. “My team mate Ike was great. I can’t say enough good things about him, and it would have been very difficult to complete this race without his assistance. I knew he was a physically-strong paddler, but the reason I asked him to join me is because I also knew he was mentally tough and has the right attitude. These last two things are far more important during a race like this than anything else. You are literally on your own and depend entirely on each other. “We always valued each others strengths and never had any issues. In such an extreme environment, it’s extremely important to chat about any disagreements directly and resolve them, but we never had any tough issues which made it so much easier. Paddling for 18 hours you become extremely tired and your body & mind is stressed, so if the synergy is not right with your team mate it would quickly turn into a disaster. “The other key point is preparation. You really need to test all of your safety gear and food before the race and make sure it works ok for you. Discovering something has gone critically wrong when you’re two days’ paddling from the nearest village would not be a great feeling. “We have met some very special people during and after the race. Not only our fellow paddlers, but also the locals who live here year-round. The harsh environment in this part of the world attracts many unique individuals, from the truckers driving the ice highways, the fur trappers, and even a father & 12-year-old son who were in the middle of a 12-week hike through the Alaskan wilderness. It’s truly a unique part of the world. “A very special thanks goes to the race organisers Jon and Harry who put all their heart into doing a phenomenal job, along with my beautiful wife Dagmar who was keeping the SUP community updated on Facebook and Instagram. “If you ever want to attempt the longest race in the world, and if you’re ready for the adventure of a lifetime, then add this race to your bucket list. But be prepared and be forewarned: this is extremely tough and organisers do a through vetting process. This year 15 teams entered but another 17 were turned away for lack of experience. CORRECTION: An earlier version of this article stated that 2018 was the first year stand up paddlers were officially allowed to compete, however Kim & Ben Friberg first completed the race on SUPs in 2014 (as an official part of that year’s race, not an experimental division as previously suggested).